The support that Ride To The Wall has received over the last few years from the motorcycling community has been fantastic and quite humbling. A large number of participants in the ride ask how they could do more and were especially keen to get their ride sponsored. 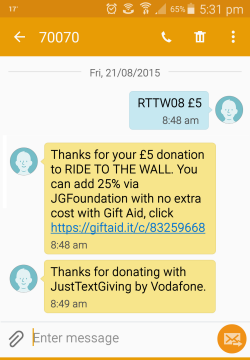 If you are organising your own fundraising event or simply want to donate, Ride To The Wall has its own Virgin Money Giving fundraising page. Virgin Money Giving is a 100% not-for-profit charity fundraising website. Part of the Virgin group, it's the official fundraising site of the Virgin London Marathon – the biggest annual fundraising event on the planet. It's designed purely to help people raise more money online, without taking a penny in profit.